If you are a developer building Windows Phone 8 apps and publishing these apps on Windows Market, you probably want to know the download count of your apps on your phone without logging to the Windows Phone Dev Center portal each time. 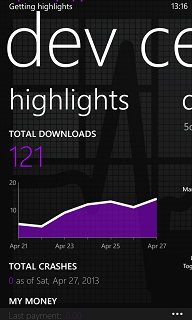 Microsoft has released Dev Center app for programmers creating Windows Phone 8 apps to track real life data about their WP8 apps like download count, crash count, user feedbacks, etc. 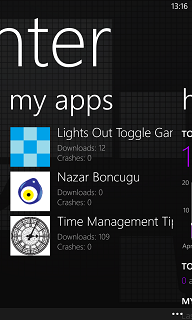 The best answer for the question "How to find downloads count for Windows Phone apps?" for Windows Phone 8 app developers is to download Dev Center app from Microsoft Windows Phone market for free. But Dev Center app requires a valid Windows Phone Dev Center account. Of course if you need to track your apps statistics like download count, crash count, etc you should have already signed for Windows Phone Dev Center account. You need this account for publishing your WP8 apps to Windows Store. 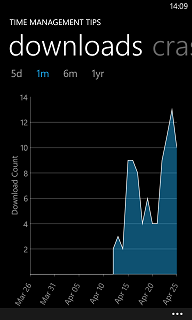 Dev Center app itsef is a simple panorama app that displays graphs showing download and crash trends for your apps on Windows Market. Enables you view your customers reviews about your apps. So Windows Phone developers can keep tracking of their apps real life results and feedbacks from customers online using from their own Windows Phone 8 devices using the Dev Center app.